Self sufficiency is our ultimate dream but we’re not stupid; we know it’s an impossible one. There’s no way the Homestead, in this location and this guise, can ever be totally self sufficient. There will always be the need for a weekly grocery shop, a monthly electricity bill to pay, and there’s no way we could ever grow all our own animal feed. What we can do is put systems and practices in place that limit our reliance on others; be they people, organisations or the planets resources as a whole. It all sounds very grand and egocentric but really it’s pretty basic when you boil it down. It starts with growing some of your own food. The scary thing is that gardening is an art steeped in rules of good practice and right ways to do things. There’s the proper planting times and seed depths, full sun verses semi shade, north,south, east, west facing, mulching and compost and NPK values. We learnt two things very early on. One: whatever we do plant, it won’t grow as big, many, luscious or for as long as anyone elses, and two: we’ll never know enough. The acquiring of this knowledge was quite liberating. When you have near-zero expectations you can only succeed. Every year we have our success stories, our shaming failures and in the middle a lot of “it’ll do”s. We’re not going to win any awards with anything in our garden; our nectarine has leaf curl, our courgettes tend to get mildew, we always harvest our radishes too early and our beans are repeatedly flattened by the prevailing easterly. Despite this, we manage to scrape a meal together from our various plots most evenings. Some days we even get a little bit extra to put away for another day. That’s what we did today, between doing the weekly grocery shop (a day early because tomorrow is our provinces anniversary day, Show Day) and joining the audience at the Kingdom of Nova’s annual Musical Offering. We call that a win-win: a few vegetable servings tucked away for sometime later and happy goats, one of whom will turn it into the main ingredient of an accompanying parsley sauce. 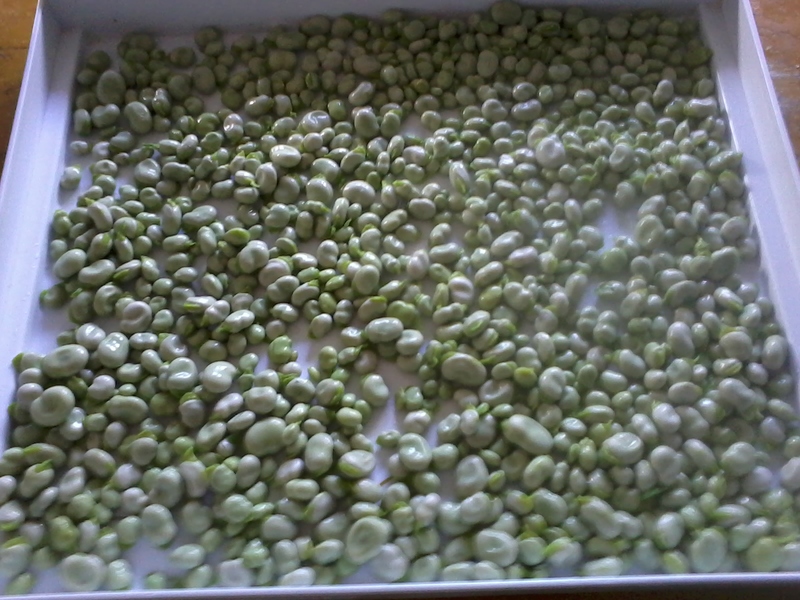 We already know everyone else in the world’s broad beans are prettier and more tasty, exquisitely formed, identically sized, pellets of perfection which grew in such abundance that they ended up giving truckloads away. But these ones’s are different: these ones are ours. 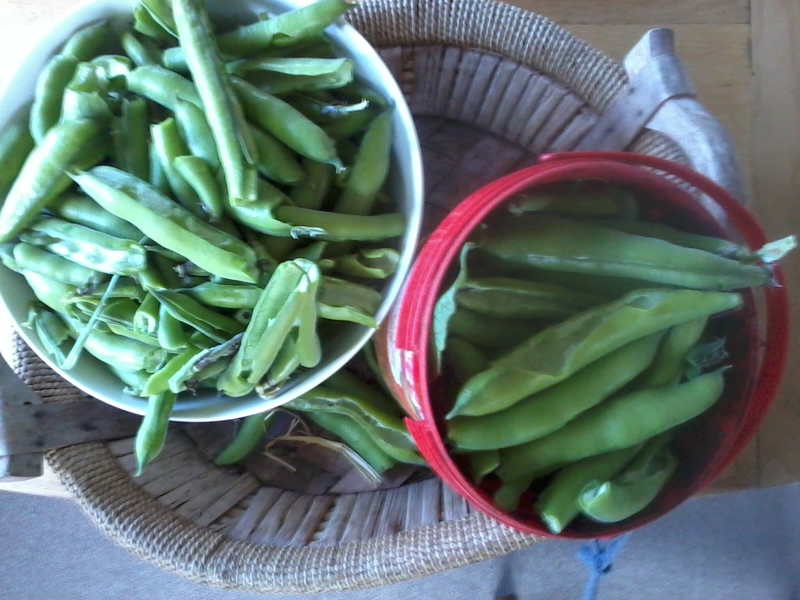 This entry was posted in Garden and tagged allotment, Aotearoa, beans, broad beans, Christchurch, garden, growing, harvest, Homestead, Homesteader, homesteading, NaBloPoMo, New Brighton, New Zealand, organic gardening, Otautahi, Permaculture, self sufficiency, self sufficient, small holder, small holding. Bookmark the permalink. I brought in the last bit of cabbage yesterday… Wormy and stunted, lol. Still makes good sauerkraut! Like you say, when it’s your own…. It all looks and sounds good to me, a city flat dweller with not so much as a window box! I operate most of my day on the “it’ll do” principle. My hen house is a case in point. Nuff said. I do the opposite thing with radishes, letting them go so long they go wormy and hollow, and your broad beans beat the ones I can never grow absolutely hollow. Dang, hit “post” before I was finished…I wanted to say I completely agree, self sufficiency is more about resiliency in my mind. The journey, the striving towards…since we’re never going to arrive at a place where we can say, there I’ve done it, I’m completely self sufficient, we might as well enjoy the process. And for the book, no one should want to be completely self sufficient – we are creatures that need community for so many reasons. Totally agree re: the need for community. We are social beasts when all is said and done. Own beans? Nobody can grow better ones than that. Breaking away from the perception of perfect food is a hard one. Home grown tomatoes look different to the supermarket ones (and taste and smell different (better) too) and homegrown carrots are never as straight as the ones in the ships. However, does the straightness of a carrot affect its taste or just its packageability? They fit better in those plastic bags if they are all a certain size. Gardening shouldn’t be about the biggest veggies or the prettiest ones – at the end of the day, we are producing food. And if its edible and as organic as possible, we have done our duty to ourselves, the environment and importantly the kids. Great efforts as always.